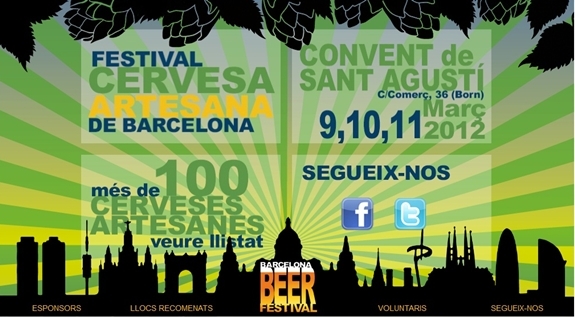 Welcome to the first edition of the Barcelona Beer Festival, a meeting point for artisan beer lovers. The BBF has been born with the aim to show the wholesome qualities of artisan beer to the general public. The centerpiece of the festival will be an enormous bar with 36 beer taps where a huge variety of artisan beers (around 100 types) can be sampled, both brewed in Spain and from abroad. The festival will take place in the Convent de Sant Agustí, in Born. A gothic cloister that forms part of the cultural heritage of the city, it sounds like a great location for the festival! So, if you’re around and you like beer, make sure to stop by, although I am more a wine-person than a beer person I think it sounds like fun! This sounds interesting and fun. I'm not a beer drinker at all, so I'm not sure how I'd go with this. I'm sure the atmosphere will be great though! Me neither, but sometimes my curiosity wins, so I went and had a look! So true, not much of a beer drinker at all but had to have a look didn't I?